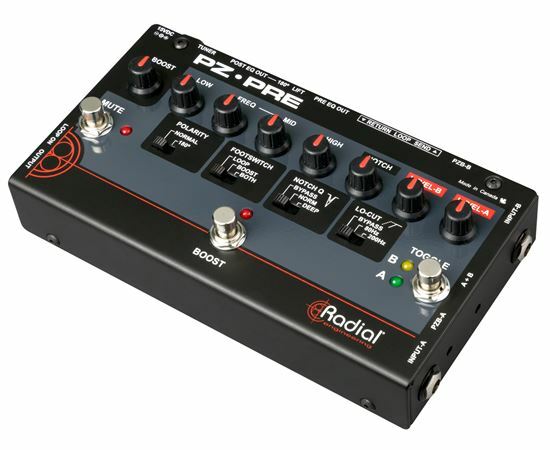 Shop Radial ToneBone PZ Pre Acoustic Preamp from AMS with 0% Interest Payment Plans and Free Shipping. 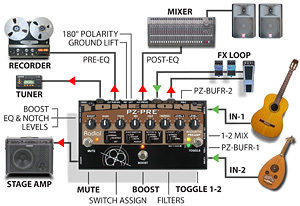 The Radial Tonebone PZ Pre is the most powerful acoustic preamplifier ever to be put inside a pedal. And when we say acoustic, we do not just mean acoustic guitar; we mean ANY acoustic instrument including banjo, violin, cello, mandolin, contrabass, bouzouki or lute. The magic of the PZ Pre lies in the combination of high performance 100% discrete class-A piezo boosters, an ultra-quiet preamp circuitry that will adapt to any pickup system and a host of connectivity options that put you in control of any situation. 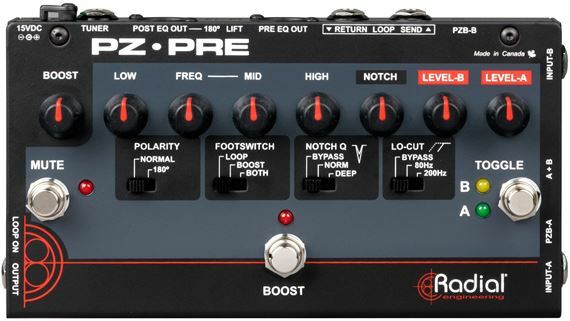 The PZ Pre features two inputs for quick instrument changes on stage, a powerful yet warm sounding semi-parametric EQ to tailor your sound, plus a host of feedback eliminating controls including: a dual-Q notch filter to surgically remove feedback points, a high-pass filter to cut low frequency resonance and a phase reverse switch to optimize the acoustic environment on stage. The PZ Pre is equipped with three separate outputs: a 1/4 inch on-stage instrument amp out, a balanced XLR pre-EQ direct out for the house mix and a balanced XLR post EQ out for stage monitors or in-ears. A dedicated tuner out with mute switch is provided for quiet on-stage tuning as well as an effects loop and power booster to add sizzle and dynamics to the performance! Compact and easy to use, the Radial PZ Pre packs in all of the features you need to take your acoustic instrument from home to studio and club to concert. The PZ Pre is more than just a sonically pure acoustic instrument preamp... much more. 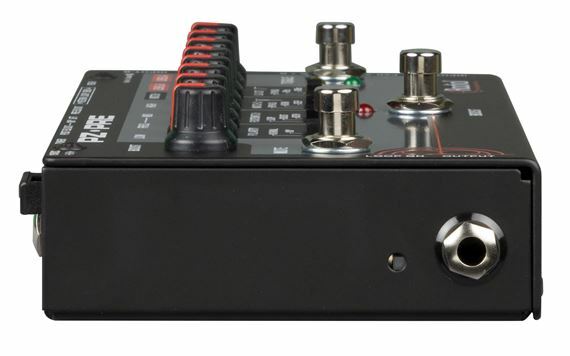 It's an amazingly versatile on-stage control center for your acoustic rig! As illustrated here, the green arrows show the two independent instrument input channels and the effects receive jack. The red arrows show the outputs, including the stage amplifier output, dedicated tuner out, pre-EQ balanced out, post-EQ balanced out and FX loop send. The three footwitches let you effortlessly toggle between instruments, bring in boost and/or effects and mute the output for quiet tuning. Set the recessed Peizo buffer switches to suit your instrument's requirements, then adjust separate levels to balance them. Lo-cut, Notch filters, parametric EQ and boost level controls allow the perfect fine-tuning of all parameters of your sound. Exceptionally powerful preamp with flat response and headroom. The Piezo Buffer feature ensures that a passive piezo has enough juice and impedance to sound its best and if you have an active pickup, turning off the PZB ensures ample headroom and adequate impedance. The EQ is super effective and the hi-pass filter is a great feature for pulling rumble out of your guitar and if that doesn't work, there's a 200hz hi-pass and a Notch Filter. No excuse for feedback. I've used mine with two guitars equipped with passive Baggs piezos (LB6 and iBeam) and the LB6 sounded its best with this unit. I think, in the future, I'm going to set up the PZ Pre to blend inputs instead of toggle between guitars. I'm possibly going to add an active mic to my guitar and I think it'll be interesting to experiment with its blending capabilities. This preamp does it all but I won't give it a perfect score as some might prefer separate EQs for separate sources. That said, it's pretty much perfect. 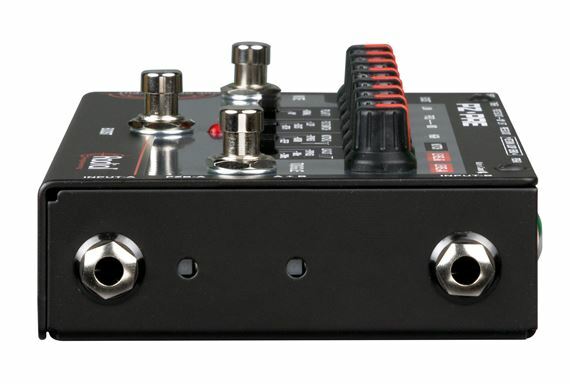 Great acoustic preamp/DI pedal with more features! Excellent preamp to use in your electrified aocustic sound chain. two inputs - selectable with a switch or blendable, and with separate switchable piezo boosters if your guitar does not have a built-in preamp. Dedicated tuner out (don't have to worry about a noisy tuner in line); built-in boost to jack up your volume for leads, switch also controls an FX loop. XLR balanced and 1/4" (amp) outputs. Notch filter to take out the bad feedback frequency. Semi-parametric EQ. Very solid and sturdy, built well. Switches are tough and you know when you are engaging them, all jacks seem sturdy. Great tone out of this box. So far it's held up well. I have a feeling the footswitches might be an issue... I think they're the same type as the line 6 modelers have.. which I've had fail... they interact with a board mounted switch instead of being actual switches... I'm gonna baby them. Vastly improved the sound of my piezo violin pickup.